"The gamification of learning is an educational approach to motivate students to learn by borrowing the best parts of video and board games and applying them to lessons and activities." This course is designed for all K-12 educators looking for a fun and engaging way to help students take control of their own learning by using gamification. It can be used for all subject areas at any level. This course is designed to teach you how to better engage learners by using gamification in their lessons. Throughout the course you will explore what elements make something “gamified,” and how to easily create and incorporate them into activities, lessons, or units. 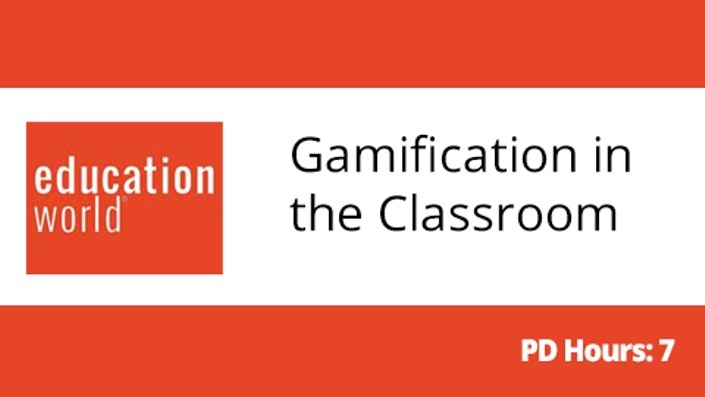 You will learn about the common misconceptions of gamification, and why this often-misunderstood method of teaching can be powerful, especially for those learners who are “at risk” and often disengaged with learning content. You'll discover how intrinsic and extrinsic motivations work, and how gamification can foster a growth mindset towards learning. Ultimately, you will learn how to use gamification as fun, non-threatening built-in assessment for any class content where students get to use choice and voice in their learning. You will also get to view gamified lesson content samples that are already in use by teachers around the world. Be able to explain what gamification is, and why it’s a powerful way to engage students. Have explored how to use gamification as an assessment tool. Understand how to maximize student engagement and foster a growth mindset culture. Gain the competence and confidence to create their own gamified activities, lessons, units, or even full-year themes. Receive a host of valuable lesson samples/resources to use in their classes. Upon completion of this course you will receive a Certificate of Completion stating your name, date, hours and name of the course. NY State CTLE Certified - Our online courses are CTLE NY State certified. Mike Ginicola has taught K-6 health and physical education for 20 years, and was the 2016 recipient of the CT PTA Teacher of the Year Award and CTAHPERD Outstanding Program Award recipient. He was the 2017 recipient of the national American Heart Association/SHAPE grant and award. He was also the 2016-17 community champion award winner for his school district. He’s currently serving on the board for CTAHPERD. He’s presented nationally on gamification and shared its power on the “Global Voxcast” and “Under the PE Umbrella” podcasts. In 2016, Education World Partnered with S&S Worldwide to begin offering both online and on-site workshops and courses to educators across the world. Many of our subscribers and readers are required to obtain continuing education and Professional Development hours throughout their careers. Time, relevancy and quality are the concerns we hear across all industries in regards to Professional Development available, so we wanted to help change that. As we head into our third year of offering Professional Development services, we are proud to say we've helped over 4000 professionals with their online PD needs so far. When does the course start and finish? Most courses available start as soon as you enroll and can be taken at your pace. We suggest trying to have it done within 4-6 weeks. Graduate level courses operate like a normal college level course and have a start and end date. Refer to the course you are interested in or contact us for a list of start dates. What type of payment is accepted for this course? **Courses with available CEUs or Graduate Credits have an additional cost through a University associated with them if you plan to obtain the credits. Professional Development hours through the S&S Online School come with the course enrollment fee. Credit Card - The easiest way to pay for one of our online courses is to use your credit card. Our online system will send an email receipt after you place your order with your credit card which you should be able to use for reimbursement. Payment with a Purchase Order (PO) - We are happy to take payment via Purchase Order (PO). Remember, however, we cannot have you start the course until the PO has been paid for by your school or school district. *Please make note that for graduate courses we will need a PO several weeks in advance and payment before the start of the course. Email us your PO ([email protected]). Make sure to include the following information; make PO out to S&S Worldwide-The Educators Network, 75 Mill St., Colchester, CT 06415, Phone: 678-764-2536, Email: [email protected], include the name of the teacher who is taking the course along with his/her email, include name of course, include billing email as we will want to email the invoice promptly. We will register the teacher in the course for you and then we will send an email to the teacher telling them of their UN and PW for the ssww.teachable.com website. They can start the course at anytime after that. See All FAQs by clicking here.